Designed by Claus Bonderup & Thorston Thorup for Fog & Morup in 1960s/70s. The lamp needs 1 x E27 Edison screwfit bulb. Aluminium, outside black, inside white lacquered. 60 cm, shade height ca. 30 cm, adjustable hanging height. Wear consistent with use and age. Scratches and paint loss esspecially at the edge (see the images). The Lamp is wired and works. Please look at the XXL-Photos. 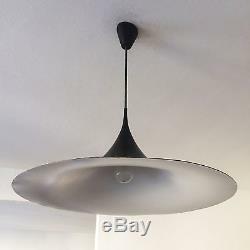 The item "XL Mid Century FOG & MORUP Black SEMI PENDANT LAMP Light BONDERUP & THORUP 60cm" is in sale since Thursday, December 29, 2016. This item is in the category "Antiques\Periods & Styles\Mid-Century Modernism". The seller is "munichmodern" and is located in München. This item can be shipped worldwide.